The following script allows you to simulate sample runs of Win, Loss, Breakeven streaks based on a random distribution, using the run length encoding function, rle in R. Associated probabilities are entered as a vector argument in the sample function. You can view the actual sequence of trials (and consequent streaks) by looking at the trades result. maxrun returns a vector of maximum number of Win, Loss, Breakeven streaks for each sample run. And lastly, the prop table gives a table of proportion of run transition pairs from losing streak of length n to streak of all alternate lengths. Nothing unusually exciting on this post, but I happened to be engaged in some particle based methods recently and made some simple visual observations as I was setting up some of the sampling environment in R. I am also using Rkward and Ubuntu to generate, so I'm gathering everything from the current environment (including graphics). Fig 1. 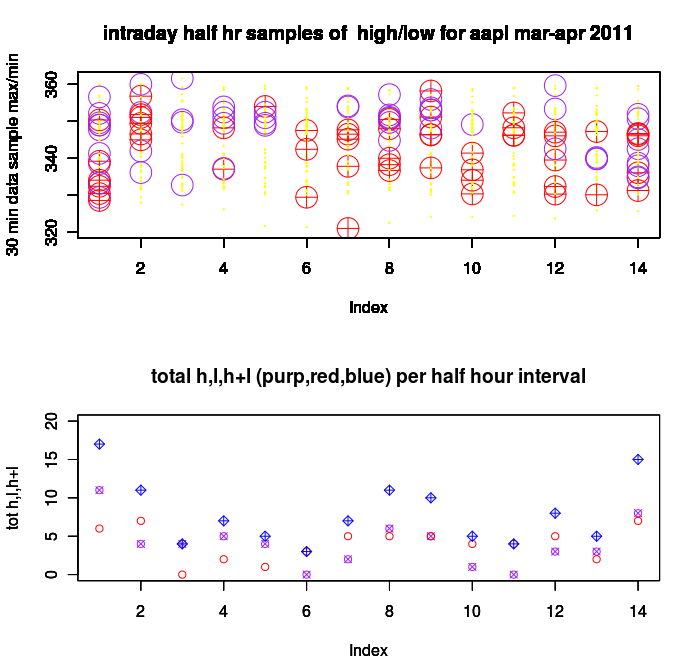 Parallel plot of half hr sample of High and Low intraday data points vs time (Max is purple dots, Min are red). Fig 2. Cumulative count of high low events per interval (blue = total high and low). 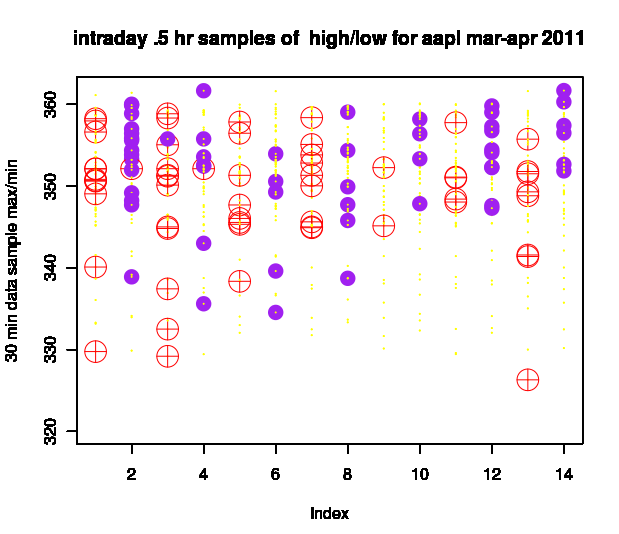 The plot illustrates sampled intraday data at half hour increments. The highs and lows of each sample interval are overlaid using purple to denote an intraday high and red to denote an intraday low. 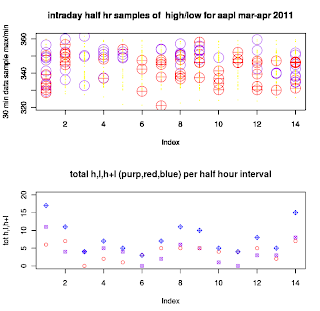 1) The high and low samples tend to be clustered at open, midday, and close. 2) High and low events do not appear to be uniformly and randomly distributed over time. This kind of data processing is useful towards generating, exploring, and evaluating pattern based setups. The study is by no means complete or conclusive, just stopping by to show more of the type of data processing and visual capabilities that R is capable of. If anyone has done any more conclusive studies I'd be interested to hear. P.S. If anyone notices any odd changes, for some reason Google was having some issues the last few days, and it appears to have reverted to my original (not ready to launch) draft.